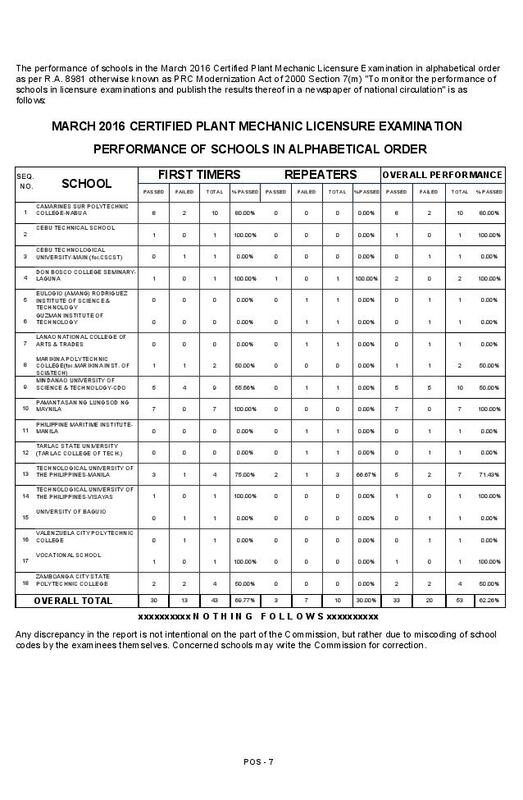 Certified Plant Mechanic March 2016 Board Exam Results (List of Passers, Topnotchers, Performance of Schools) - Balita Boss! The Professional Regulation Commission (PRC) released the official results of March 2016 Certified Plant Mechanic Licensure Examination on Tuesday, April 5, 2016. The examination was conducted by the PRC on March 30 and 31, 2016 in the cities of Manila, Baguio and Cebu. A total of 33 out of 53 passed the March 2016 Certified Plant Mechanic Licensure Examination, according to PRC (via PRC Website). The Board of Mechanical Engineering who administered the Certified Plant Mechanic Board Exam are Engr. Jesus M. Redelosa as Chairman, with members namely Engr. Fernando S. Guevara and Engr. Mirardo C. Malazarte, Jr. Starting April 11, 2016, registration for the issuance of Professional Identification Card (ID) and Certificate of Registration will be done on-line. Please go to www.prc.gov.ph and follow instructions for initial registration.. The date and venue for the oathtaking ceremony of the new successful examinees in the March 2016 Certified Plant Mechanic Licensure Examination will be announced later, the PRC said. During the last examination, a total of 24 out of 51 passed the September 2015 Certified Plant Mechanic board exam, PRC announced. Thank you for reading. Please follow Balita Boss? on Facebook, on Twitter or on Google+ to receive updated information about the Certified Plant Mechanic Licensure Examination.